Replace your desktop PC with the Toshiba Satellite A505-S6973, which features a 16-inch diagonal HD TruBrite widescreen LED-backlit display, touchpad with multitouch control, power-saving Eco Button to help reduce power consumption based on your needs, USB Sleep-and-Charge ports, and a dual-layer DVD±RW drive that burns CDs and offers LabelFlash print functionality. The bright 16-inch LCD (1366 x 768) offers a true 16:9 aspect ratio and 720p native high-definition resolution, and the A505 is great for using as a media center with the touch-sensitive media keys placed above the keyboard. And it's sure to stand out in the crowd thanks to the stunning Fusion Finish with Sonic pattern in Black Onyx.It's powered by the 2.1 GHz Intel Core 2 Duo T6500 processor, which boosts speed, reduces power requirements, and saves on battery life. It also offers a fast 800 MHz front-side bus speed and 2 MB L2 cache. It also includes Intel's 5100AGN wireless LAN, which will connect to draft 802.11n routers and offers compatibility with 802.11a/b/g networks as well. Other features include a 500 GB hard drive, 4 GB of installed RAM (upgradeable to 8 GB), 1.3-megapixel webcam, Harman Kardon speakers, 5-in-1 memory card reader, HDMI audio/video output as well as SPDIF digital audio output for 5.1-channel surround sound, and 64-bit version of the Microsoft Windows Vista Home Premium operating system. 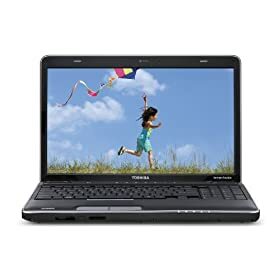 This Toshiba notebook is Energy Star 5.0 certified and it is RoHS-compliant, effectively reducing the environmental impact by restricting the use of lead, mercury and certain other hazardous substances. Sleep-and-Charge USB port allows you to charge your mobile phone and other devices even when the notebook is asleep or off. Touch pad with multitouch control gives you a whole new dimension of freedom--the ability to pinch, swipe or rotate images on the display screen with the brush of your fingers. HDMI-CEC audio/video output lets you control additional media players with just a single remote. Entrecard toolbar for Firefox 3.5!